Zelus, also known as Zelos, was a lesser deity in Greek mythology. His parents were Titans Pallas and Styx. He had three siblings, Kratos (strength), Nike(victory), and Bia(force). Zelus and his siblings had wings and were the protectors that stood guard around Zeus’ throne. Zelus’ was known for his qualities of, dedication, envy, emulation, eager rivalry, jealousy, and zeal. In fact, the word zeal is derived from his name. It is said that Zelus may have been associated with Agon, who was the spirit of contest and was regarded with deep love at Olympia. He was also described as being similar to Phthonos the spirit of romantic jealousy and was closely associated with Eris, the driving force of competition. Zelus’ siblings were close friends of Zeus. Zeus was the dominant deity of the Greek temple to all the gods. Later, in classical mythology, Styx was said to have brought Zelus’ siblings to Zeus at the time he was gathering allies for the Titan War against the elder deities. Nike would take on the role of the divine charioteer. This is the role she represents in Classical Greek art. 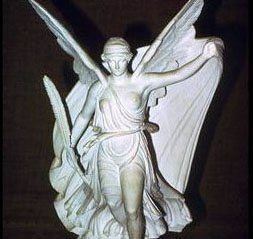 Nike would fly around the battlefields providing the victors with fame and glory. Zelus’ brother Kratos was the god of strength, power, might, and sovereign rule. Bia was the representation of force. When war broke out between the Olympians and the Titans, Bia and her brothers and sisters sided with Zeus. With their wings, Zelus and his siblings were angel-like beings surrounding and guarding the heavenly throne of Zeus. For their dedication in battle, Zeus would honor all of Zelus’ siblings with his constant companionship.